All transactions are safe and secure with a reliable history in online purchasing behind each of our associates. 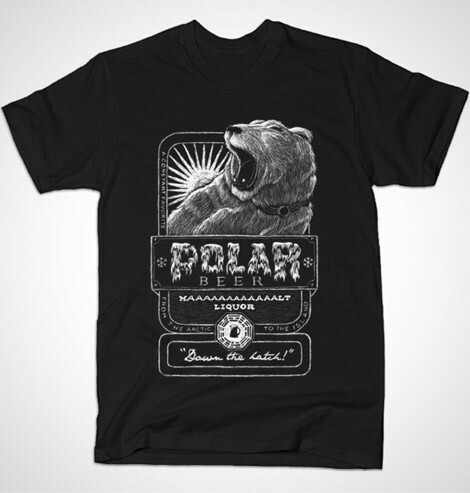 Buy the Polar Beer t-shirt to own Lost clothing and merchandise. Some of the biggest mysteries on the island include the black smoke monster, the polar bear shown on this Lost tee, and the hieroglyphics symbols that appear on the timer after Locke lets the countdown expire during the episode titled "One of Them." After viewing these episodes of the ABC Lost TV show, fans scrambled to try to figure out the meaning behind these oddities. This design incorporates the Lost polar bear into a beer logo shirt. Match this polar bear design with Lost hats. In addition to the Polar Beer tee above, browse the Lost Clothing Gallery for more apparel like men's and women's clothes, kids shirts or hoodies.